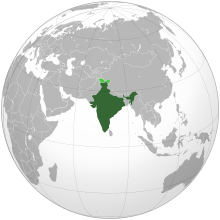 ↑ "National Anthem - Know India portal". National Informatics Centre(NIC). 2007. Retrieved 2007-08-31. ↑ "National Song - Know India portal". National Informatics Centre(NIC). 2007. Retrieved 2007-08-30. ↑ "Constituent Assembly of India — Volume XII". Constituent Assembly of India: Debates. parliamentofindia.nic.in, National Informatics Centre. 1950-01-24. Retrieved 2007-06-29. The composition consisting of the words and music known as Jana Gana Mana is the National Anthem of India, subject to such alterations in the words as the Government may authorise as occasion arises; and the song Vande Mataram, which has played a historic part in the struggle for Indian freedom, shall be honoured equally with Jana Gana Mana and shall have equal status with it. ↑ "India at a Glance". Know India Portal. National Informatics Centre(NIC). Retrieved 2007-12-07. ↑ "India at a glance: Population". Census of India, 2001. Government of India. Retrieved 2009-04-25. ↑ 8.0 8.1 8.2 8.3 "India". International Monetary Fund. Retrieved 2009-04-22. ↑ "Field Listing - Distribution of family income - Gini index". The World Factbook. CIA. 15 May 2008. Retrieved 2008-06-06. ↑ "Total Area of India" (PDF). Country Studies, India. Library of Congress – Federal Research Division. December 2004. Archived from the original (PDF) on 2005-02-26. Retrieved 2007-09-03. The country’s exact size is subject to debate because some borders are disputed. 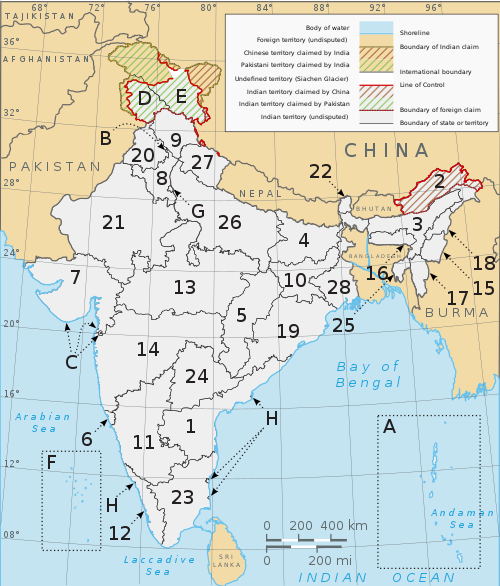 The Indian government lists the total area as 3,287,260 square kilometers and the total land area as 3,060,500 square kilometers; the United Nations lists the total area as 3,287,263 square kilometers and total land area as 2,973,190 square kilometers. ↑ "Hindustan". Encyclopædia Britannica, Inc. 2007. Retrieved 2007-06-18.